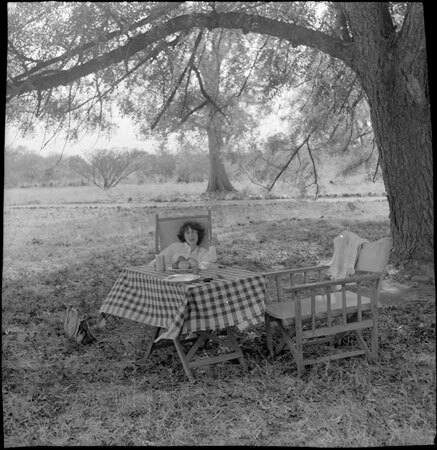 A portrait of Oxford anthropologist Jean Buxton sitting at a picnic table set up by herself and her supervisor Godfrey Lienhardt in the shade of a large tree at Gogrial. Lienhardt and Buxton visited each other during fieldwork in 1950 whilst he was working with the Dinka around Gogrial and she with the Mandari around Terakeka and Tali.. The table is set with a bowl of fruit, and a pipe and box of matches belonging to Lienhardt, who is the photographer. Morton, Chris. "Jean Buxton at a picnic table" Southern Sudan Project (in development). 03 Jan. 2006. Pitt Rivers Museum. <http://southernsudan.prm.ox.ac.uk/details/1998.97.571/>.